At your next gathering, transform your snack platters into a three ring circus with these cool new Circus Party Picks. 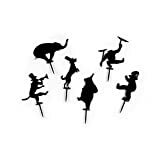 These hilarious party picks depicts silhouettes of circus animals like monkeys, bears, and elephants dancing, playing musical instruments, and apparently balancing on top of your appetizers as well. The picks are reusable, come in a set of 18, and pair nicely with the equally funny Boogie Bites Party Picks.